With renovations to the third floor of Reynolds Hall completed, students returning for the Spring 2017 semester finally got a look at the new classrooms and lab areas. 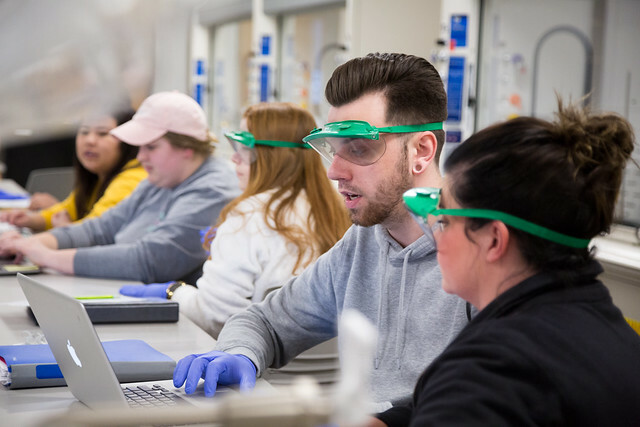 “As one of the Lab preppers for the General Chemistry classes, I see how much better the new labs are,” said Cole Corlett, senior biochemistry major. “We have more counter space and the new hoods are fantastic. Reynolds became the second campus building ready for occupancy when it was completed in May of 1967. An expansion in 1988 nearly doubled its size. Last year, former Gov. Jay Nixon announced funding to allow for much needed renovations to the building, which houses the biology, environmental health, physical science and mathematics programs. House Bill 19 provided $5.2 million for the project, while House Bill 17 contained an additional $1.5 million, which was matched by private contributions from alumni and other sources. The newly renovated third floor features physics, chemistry and geology labs, a study area equipped with Wi-Fi and hard-wired data drops, a tiered lecture hall and faculty offices, as well as new equipment. Dr. Marsi Archer, chair of the Chemical and Physical Sciences Department, said the new labs provide a safer environment and one that is more conducive to learning. She and Corlett both cited the new DSR Raman spectrometer as one of the more exciting additions to the building. The device is used in chemistry to provide a fingerprint by which molecules can be identified. Having completed work on the third floor, renovation work proceeded to the first floor, which will primarily house biology labs, classrooms and offices. Those classes were moved to a temporary home in the nearly 13,000-square-foot Reynolds Annex building, located on the southwest side of campus.